At this time of year my thoughts are always drawn to our University’s founding motto: Ut Vitam Habeant – So that they may have life. As a University we are unique in that we were founded as a living memorial to those who lost their lives in the First World War. The men and women who built this new institution hoped that it would be not only a living memorial to the darkness of their recent past, but a beacon of hope for the future. Their aim was that sacrifices made in war should be commemorated through education and research that would change the world for the better. 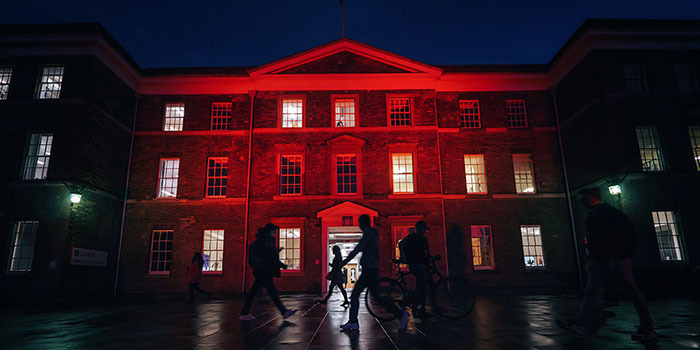 In recognition of Armistice Day we are lighting the Fielding Johnson Building in red as part of the County Council’s Light Your Building in Red 2016 initiative. Run by the WWI Reference group (of which we are a member) and with the support of the Leicestershire and Rutland Royal British Legion, the initiative invites local organisations to Light Up their Building in Red in support of the Poppy Appeal and the Centenary of the First World War. As we commemorate Armistice Day in the lead up to the 100th anniversary of the end of the Battle of the Somme, during which approximately 80,000 men died, it is worth reflecting on how the University continues to live up to the words and ideals of its founders through its continuing work. We have communities of academics who are specifically looking at security and conflict resolution. We have academics looking into nuclear non-proliferation and disarmament, on the peace process in Northern Ireland and on the use of drones in warfare. We also collaborate with the Ministry of Defence on Project Nightingale, an archaeology project in Cyprus which aims to provide a retraining package for military veterans who have been injured in the line of service. Our newly formed School of History, Politics and International Relations has created a community of interdisciplinary academics with recognised research and teaching strengths in the security field and in international relations past and present. This shared resource and expertise, plus a partnership which has been recently signed with NATO, mean that HyPIR has the potential to become a recognised centre for excellence in security, conflict and international development. We have held conferences and worked on the role of education to build capacity in post-conflict societies. Indeed, we have worked for the past few years to provide English language support and education in Kurdistan and recently welcomed the EU’s Kurdistan Ambassador to the University to talk on that very subject. We are an outward-looking global community, in which dedicated and talented people are anticipating, working towards and helping to shape the future. We are committed both to undertaking research that saves, improves and enriches lives, and to fostering a teaching and learning environment that transforms the prospects of our students and those they will go on to influence. In short, the University of Leicester is becoming all our founders hoped we would be; and doing so in the consciousness of the responsibilities of our unique heritage. And finally, on a strictly personal note. My thoughts will also be with Gunner Tim Utteridge who was shot dead in Turf Lodge, West Belfast on 19 October 1984. He was with the Royal Horse Artillery but had volunteered to join the 3rd Battalion Royal Green Jackets in order to make up our numbers when we were posted to Belfast that autumn. He was 19. I have always thought that it was very inspired of our City and County fathers that they created the foundations of our University as a living memorial to those many many young men who lost their lives in the First World War. Now it stands, remembering men and women who have lost their lives in conflicts over the world since that time as well as so many more gravely injured. The scale of sacrifice is barely imaginable, the debt we all owe is beyond measure. The University has much to which it has to live up, and clearly tries hard to deserve the inheritance.